I’m not too crazy about strawberries in baked goods. Baked strawberries turn pale and sad. Roasted strawberries, on the other hand, are vibrant and intense. We’ve been roasting strawberries at work over the last couple weeks (it’s actually a great way to save berries that are on the verge, so to speak, or were never that great to begin with), and I thought I’d take the concept home with me. This is a super easy process that you can multiply or fiddle with. Strawberries and a sprinkle sugar are all that’s needed, but I added a dash of cassis to mine as well. A fairly hot oven does its magic, and in about half an hour you have a tray of deep red, syrup coated jewels. Stir these into your morning yogurt or use them as a topping for ice cream (buttermilk ice cream would be even more amazing topped with these, as would vanilla malted). And mixed in with fresh strawberries in a shortcake–forget about it. Steph’s Note: This is more of a process than a recipe. Adjust amounts depending on your quantity of berries. Although I probably wouldn’t bother to fire up the oven on a hot day for less than a quart of strawberries, this will multiply no problem. -Preheat your oven to 400°F. -Put the strawberries on a sheet tray, or in a cake pan or a small metal roaster. Use something where they fit in a single layer, but don’t have too much extra empty space where juices will just burn. Sprinkle over the sugar…you only need enough to lightly coat them, as the sweetness will intensify as they roast. -Roast for about 15 minutes, and then give the berries a gentle stir to coat them with the liquid they’ve released. 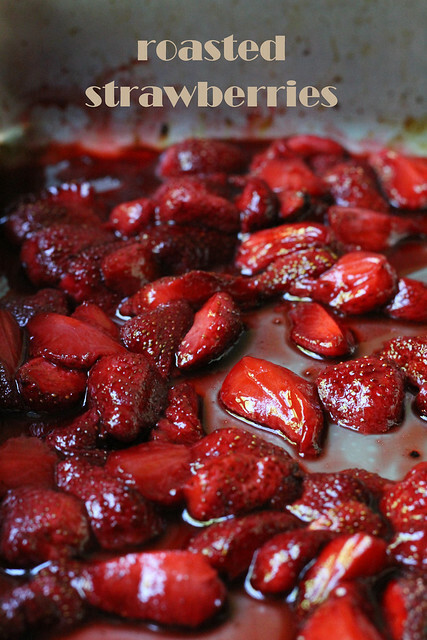 Continue to roast until the strawberries are deeply red and the juice is syrupy, almost beginning to caramelize. This will probably take another 15-20 minutes. Add in your splash of flavoring. Done….you can store them in the fridge for a several days. Looks great. What’s the bread/pastry on top of the strawberries? 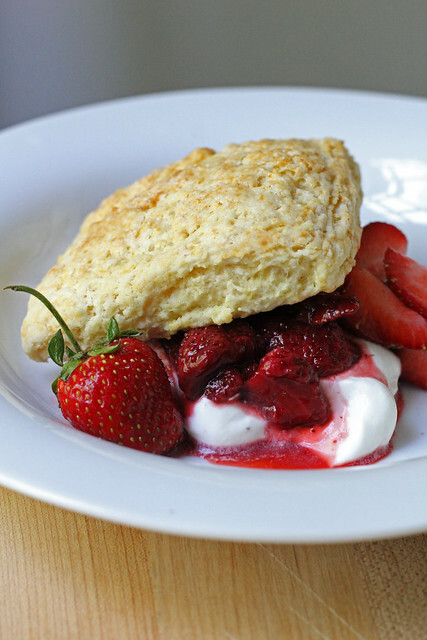 It’s a buttermilk shortcake…like a biscuit. I like the idea, will definitely try it! Wow…I always had the same thought. Strawberries look sad and old when you put it with baked goods, I am definitely using that idea of roasted strawberries and putting them on top of my sweets, because I love baked goods with fruits! I’m like you I have never been a fan of strawberries in baked goods, roasting them sounds like a perfect solution, they look and sound beautiful! This sounds like a fab idea. I have genuinely never really thought about roasting strawberries before. Looks delicious!! These look delicious and what a fantastic idea! This looks incredible. A great twist on strawberry shortcake. I never would have thought to roast Strawberries! I’m not a fan of fresh strawberries, since I hardly ever find any that taste good. Roasting them should help concentrate the flavors…how exciting!